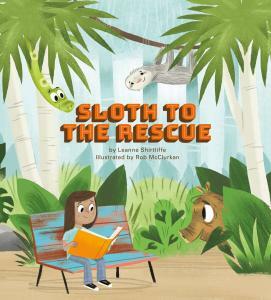 Sloth and friends teach kids how to combat first-day-of-school shyness in this humorous and heartfelt picture book. At the Rainforest Rescue Center, Sloth loves when Patti comes to visit. But when Patti forgets her class report, it’s up to Sloth, with the help of his other (faster) rain-forest friends, to return Patti’s notebook to her-at school! Will they be able to find her among all the other kids in a new environment? The first day of school can be scary-especially if you forget your summer assignment-but in Sloth to the Rescue, Sloth, Peccary, Boa, Capuchin, and Ocelot overcome their fears and realize that what makes them unique is what helps them fit right in!